I would like to propose an idea to assist in anti-bullying efforts at public schools across the nation. 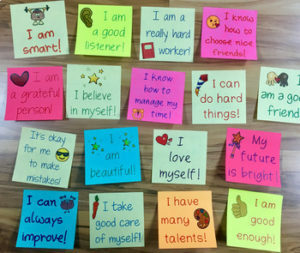 If the restroom stalls were lined with positive affirmations, I’d like to see if it would have any positive effect on students? I believe self-hatred often spills out negatively to other people. Confident people don’t slander, gossip and attack others. I would love to participate in a study to see if “enforced positive affirmation sessions” over a period of 3-6 months would have any positive effect on how people treat one another?